Rattan Futon With Metal Frame. Easy To Assemble. Strong Construction. Dimensions: 71-1/4L. X 32-1/2W. X 32-1/2H..
Palisades Full Lounger Futon. Available In Full Size, Queen Size, And Full Lounger (Folds As A Love Seat And Opens As A Full Size). Palisades Chair Is Also Available. Comes In Teak, Gold Oak, Or Rosewood Color. Palisades J&M. Solid Oak Deluxe Mission Style Futon Frame With Metal Deck And Hinges. Easy To Assemble. Strong Construction. Dimensions: 82L. X 54W. X 32H..
Oak Finish Wood And Metal Futon Frame. Easy To Assemble. Strong Construction. Dimensions: 76L. X 55W. X 35H..
Cherry finish Sleigh Bed Futon Frame With Metal Deck And Hinges. Easy To Assemble. Strong Construction. Dimensions: 83-3/4L. X 54W. X 23-1/4H..
Mission Style Oak Finish And Metal Futon Frame. Easy To Assemble. Strong Construction. Dimensions: 82L. X 54W. X 33H..
Silver Finish Futon Frame With Natural Finish Arms. Easy To Assemble. Strong Construction. Dimensions: 81-3/4L. X 54W. X 34-1/2H..
Wood And Metal Futon Combination. 39 Arms. Easy To Assemble. Strong Construction. Dimensions: 79-1/2L. X 54-3/4W. X 34H..
Metal Futon Frame With 3 Wood Posts. Easy To Assemble. Strong Construction. Dimensions: 80L. X 54W. X 32H.. Satin Black Double Arch Futon Frame. Easy To Assemble. Strong Construction. Dimensions: 79-1/2 In.(L). X 54 In.(W). X 32 In.(H). 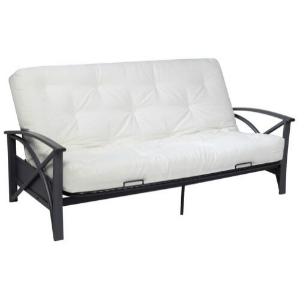 Satin Black Futon Frame With 16 Laminated Top Table In Black Or White. Mattress is not included in the price. Easy To Assemble. Strong All Metal Construction. Dimensions: 79-1/2 In.(L). X 54 In.(W). X 34 In.(H). Solid Wood Futon In Honey Oak Finish. Measures, 82x37x32H. 2509-1:Arm, 2509-2:Frame. Mattress Is Not Included. Easy To Assemble. IEM2509. Tonopah Wooden Futon Sofa Bed. Available In Oak Or Natural Finish. Measures, 60x36x28H. Mattress Is Not Included. Easy To Assemble. IEM2506_. Pewter Finish Futon Sofa. Measures, 80 x 41 x 34 1/4H. Optional (Not Included In The Price) Pewter Finish Futon Chair & Ottoman. Chair Measures, 36 x 41 x 33 1/2H. Ottoman Measures, 36 x 22 x 19H. Mattress Not Included. Easy To Assemble. IEM2368PT. 82368PT(IEM). Futon Sofa/Bed. 29 Arm Span In Black Finish. Mattress Is Not Included. Easy To Assemble. Futon Bed. Measures, 80x41x34H. Optional (Not Included In The Price) Futon Chair & Ottoman, Measures, 36x41x33H. Mattress Is Not Included. Easy To Assemble. IEM2307. Futon Sofa/Bed With 39 Arm Span. Available In Chrome And Pewter Finish. Measures, 79x39x34H. Optional (Not Included In The Price) Chromw Finish Futon Chair/Bed With Ottoman. Futon Chair Measures, 35x33x34H. Ottoman Measures, 35x22x19H. Mattress Is Not Included. IEM2301_. Shalimar Futon Sofa/Bed With 39 Arm Span Or 29 Armrest In Black Finish. Measures, 79x39Dx34H. Optional (Not Included In The Price) Futon Chair/Bed With Ottoman. Futon Chair Measures, 35x33x34H. Ottman Measures, 35x22x19H. Mattress Is Not Included. Easy To Assemble. IEM2301B_. Futon. Black Frame. Strong Construction. Easy To Assemble. Converts Easily Into A Bed. Size: 79 x 28 x 5H..
All Solid Wood Curved Mission Arm Futon Frame, in Oak Finish. Matresses Are Sold Separately. Washed Finish Futon Frame With Storage. In Full Size. Strong Construction. Easy To Assemble. Check Related Items For Matching Arm Chair. The Vera Convertible Sofa Sleeper Is Sure To Entice You. The Upholstery Is Set In Rainbow Truffle Microfiber Fabric And The Wooden Frame Made From Colored-Oak Wood Complements It Well. The Sofa Sleeper Turns Into A Sleeper In Seconds And Features Hidden Storage Underneath The Seat. Also Available (Sold Separately) Are Matching Arm Chair With Hidden Storage. The Arm Chair Also Lays Flat Into A Sleeper Perfect For Children. Strong Construction. Easy To Assemble.Dimensions:Sofa Sleeper:Sit Position: 82.6 In. x 33.4 In. x 37.7 In. (H)Sleep Area: 74.8 In. (L) x 45.2 In. (W)Arm Chair:Sit Position: 34.2 In. x 33.4 In. x 37.7 In. (H)Sleep Area: 45.2 In. (L) 22.09 In. (W)Arm Chair Sold Separately. See Related Items Below. Aspen Futon Set. This Is Beautiful And Perfect For Your Home. Available In Five Sizes: Full Aspen, Queen Aspen, Chair Aspen, Full Lounger And Twin Lounger. Strong Construction. Easy To Assemble.Colors: Urban Oak, Teak, Natural, Rosewood and Java. *Mattresses Are Not Included In The Price.